Nose: The nose starts off with subtle sherry flavours, followed by fruity notes of banana, apple, pineapple and plum. Sweet with vanilla and butterscotch, milk chocolate, and a hint of liquorice and ginger in the back. Palate: Lovely sweet and creamy on the palate with sherry, vanilla and red berries, followed by a slightly warming spiciness of oak, black pepper and ginger. Notes of red apples and milk chocolate emerge, while the spiciness increases with a second sip turning pepper almost into chili. Finish: The finish is long and warm. Becomes slightly dry with oak, dark bitter chocolate and a lingering oily nuttiness on the tail. With water: Fresh and clean on the nose with slightly bitter fruity notes of grapefruit and orange peel. Less sweet with tamed notes of vanilla and chocolate. Less rich and somehow reluctant on the palate with sweet vanilla, a tamed spiciness with white pepper and subtle prickling oak. The finish is a bit shorter but stays warm and creamy with honey and prickling oak. Comments: A very nice and quaffable Speyside single malt. Pleasant fruitiness on the nose, lovely balanced with a creamy sweetness and warming spiciness on the palate. Not overly complex but well-matured and layered. Water, however, calms the delicate flavours down. Nose: A lovely sweet start on the nose with loads of dried fruits, toffee and fine sherry flavours. Notes of dates, figs and raisins nicely linger with creamy vanilla, pears and subtle cinnamon spice in the back. A gorgeous nose considering the youth of the whisky! Palate: Pleasantly sweet and fruity on the palate with cherries, red apples, dates and raisins, all embedded in sherry and brown sugar. This is accompanied by a lovely warming spiciness of cinnamon, subtle oak, hints of pepper and nutmeg. A touch of young, metallic notes is flashing up but immediately covered by sweet orange and milk chocolate flavours towards the finish. Finish: The finish is long, creamy sweet and warm with dried fruits, followed by slightly bitter notes of orange peel and a lingering nuttiness on the tail. With water: Fresh and clean but stays sweet on the nose when a few drops of water are added. There's slightly more toffee coming through while the sherry aroma is a bit tamed. Less sweet on the palate with significantly more oaky spiciness, complemented by bitter orange peel. The finish continues to be long, slightly warm and subtle sweet. Comments: The sherry puncheon has done a pretty good job. 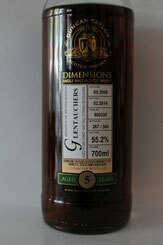 Although being only six years old, this Glentauchers already displays a nice balance of sweet, fruity and spicy flavours. There's only a hint of youthfulness but that does not at all becloud the overall impression of this delicate and quaffable dram. Water, however, isn't necessary as it calms the nice flavours down. Nose: Very fruity on the nose with apple sauce, passion fruit and delicate notes of white jelly baby. Vanilla and subtle caramel emerge with a slightly floral touch of summer flowers in the back. Palate: Very sweet on the palate but significantly dry at the same time. Barely fruity, with lovely notes of vanilla and honey lingering with creamy caramel and a whiff of oak towards the finish. 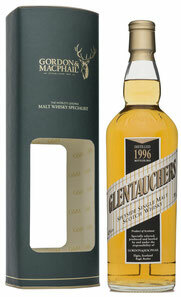 Finish: The finish is medium long and honey-sweet with tender spiced oak on the tail. Pleasantly round. With water: Lovely fruity on the nose with a splash of water. Intense scent of white jelly baby. Significantly spicy on the palate with oak, pepper and ginger. Sweet and warm with creamy caramel, vanilla and slightly dry oaky tannins. 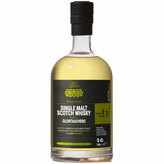 The finish is medium long, soft and sweet with pleasant sticky honey and warming spiced oak. 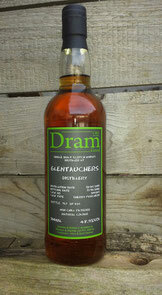 Comments: A very impressive dram with a gorgeous nose and a surprisingly very dry taste. The bourbon barrel brings delicious and amazing flavours of fruit to the fore. Significantly improves with a splash of water. Gets then rounder with delicate fruitiness, tamed mix of lovely spices and a creamy caramel note. Lovely, well balanced and pleasantly tasty. I thank Joe Seidel from Joe's Malt Shop for the sample and Five Lions for the photograph! Colour: Red gold (rusty red). Nose: Lots of sherry, yellow fruits, caramel, vanilla, almonds, and, surprisingly, a hint of bubble-gum. Quite fresh, lateron hints of grassy notes. Very smooth and gentle on the nose. Palate: Sweet and strong. Red liquorice, sherry, toffee, some fruitiness, followed by wine flavours (Madeira?) and hints of chocolate. The alcohol is already integrated after this short time of maturation. Finish: Long with lingering sherry and yellow fruity notes. Gets drier in the end with fine nutty flavours. With water: Stays sweet but develops more cereal and malty notes. Hints of flavours you get while passing the wash backs. Comments: This is a very good whisky. Sweet, smooth, rich and full bodied. Quite good drinkable considering its alcoholic strength. This one is not hiding its youth but the sherry cask has done an amazing job. Certainly, not a dram for the sherried cask lovers only.